End tables, hall tables, accent tables and nightstands made to order in Montana by Dumonds Custom Furniture. Our furniture is artistic, unique, one of a kind, rustic, modern, contemporary and traditional. End tables, hall tables, nightstands and accent tables made to order by Dumonds Custom Furniture. Mission style oak table with single drawer and bottom shelf. 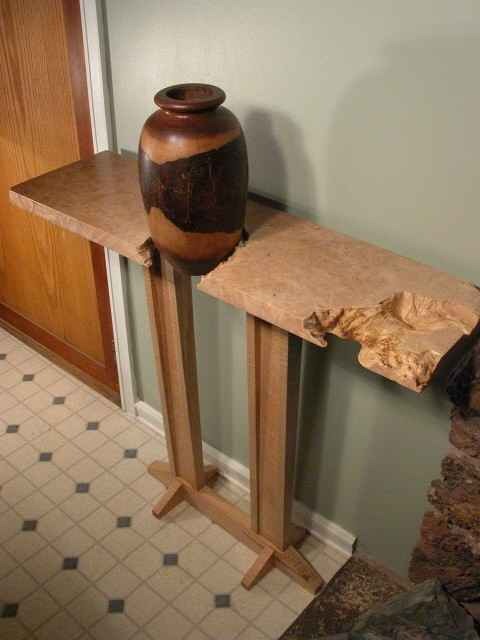 Walnut End Table with pyramid base. with contrasting handmade ebony drawer pulls would go great next to a custom bed. Custom bedroom furniture made to order by Dumonds Custom Furniture.with contrasting handmade ebony drawer pulls would go great next to a custom bed.